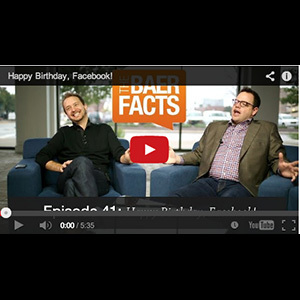 In this edition of The Baer Facts, I’m joined by Kyle Lacy of ExactTarget to wish Happy Birthday to Facebook and talk about the changing face of email. On one hand, it’s hard to believe Facebook is 10 years old. On the other hand, Facebook has become so entwined in our personal and professional lives, that it’s difficult to imagine what life was like before it came on the scene. I’ve gotten a lot accomplished in the last decade, but I’m an aimless slacker eating soup out of a can watching Downton Abbey by myself surrounded by unkempt house cats, compared to what Facebook has done in 10 years. Is Email Bucking the “everything shrinks” Trend? One thing Facebook has NOT done, however, is kill off email. Despite much gnashing of teeth through the years, Facebook and email continue to exist side-by-side in both personal and commercial contexts. Very short messages, single photos, etc. are replacing longer form exchanges on many platforms. But is the opposite occurring in email? ExactTarget recently re-launched their email news/advice product, now called Spark. It’s a useful read, made more useful because it usually gives you most of the key points within the email itself, without forcing you to click over to the website to “read more.” At Convince & Convert, we’re preparing a new version of our popular One Thing email, and will be adding more meat to that daily sandwich as well. Can Email Fix What’s Broken with Social Media? Ironically, with organic Facebook engagement rate plunging for many brands, will we see companies move toward more in-depth email publications in an effort to drive engagement there? It’s an interesting premise, because the one huge advantage of email vs. social media is its linear delivery model. If I send an email today, I know that 99%+ of my subscribers will receive it. They may not open it and they may not click any of the links, but they’ll almost assuredly receive the email. That’s of course not the case on Facebook, Twitter, Instagram (other than IG Direct), Linkedin, etc. What you publish in social is seen by a subset of your audience, even though that audience has chosen to connect with you by clicking like, follow, et al. What percentage of your Facebook fans will see any individual thing you post to your company’s Timeline? 5%? 15%? It’s impossible to say, and it varies with each post. This “reach roulette” is a weakness of social as a marketing and communication platform (and even as a customer service platform, in the event you need to inform many customers at once). What do you think? Are we entering a new era of surging company interest in email?